Ever wanted to do LSD and get that psychedelic trip that everyone’s been talking about, but can’t really do it because you know it’s, well… illegal? Then how about a little game that gives you a bit of that trip (not entirely, as I’ve heard) so you know how it feels? Welcome to Tunnel Rush! It’s a game that gives you all the colours and speed that makes you feel like it’s the 70’s again, without actually having to do something the cops can jail you for. 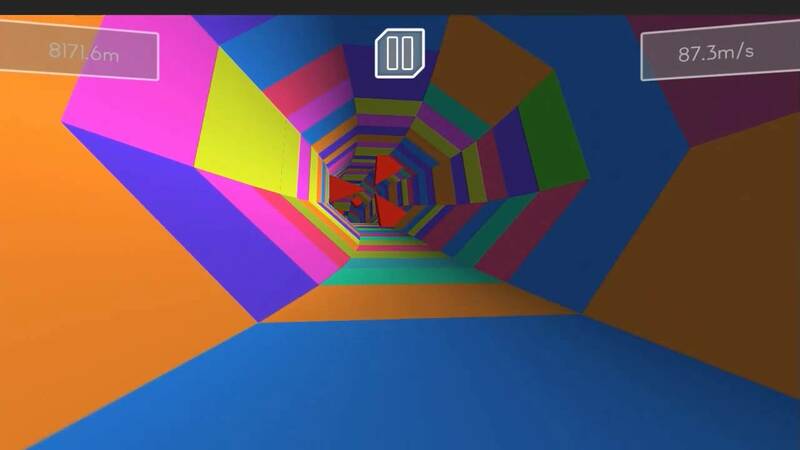 Tunnel Rush is a roller coaster simulator that puts you in front of an “imaginary” vehicle going forward through a tunnel filled with obstacles that you’ll need to avoid. Hitting a single obstacle will give you a game over, and you’ll have to start again at the very beginning (no checkpoints). The game mostly plays like an endless runner, too. The main goal of the game is to get as far as you can and beating the highest score you’ve made (or your friends made if you have other people playing). The game is played using just the left and right arrow keys on your keyboard, which is used to drive left or right. You’ll use this to avoid any walls or obstacles as you go forward automatically. Every once in a while, the tunnel inverts itself and instead of driving inside a tunnel, you’ll be driving on a circular tube – which is a pretty neat feature. Tunnel Rush is as simple as games can get, keep playing and don’t die. The game has great music and visuals, and playing it for an hour without getting tired of it is pretty understandable (as we did as well). If you’re looking for something casual and fun, as well as easy to learn, then Tunnel Rush is a good choice. This entry was posted in Driving, Physics and tagged roller coaster, Simulation. Bookmark the permalink.